A selection of Austen's dark and hilarious early writings - featuring murder, drunkenness, perjury, theft, poisoning, women breaking out of prison, men forging wills and babies biting off their mothers' fingers. This is quite possibly my favourite instalment so far in the Little Black Classics range. I could read Austen until the end of the time, and have quite an irrevocable love for her. To be able to read a collection of short stories she wrote as a teenager, which were never meant to be published and were only written for her own amusement, alongside that of her family and friends, was a complete treat for me. 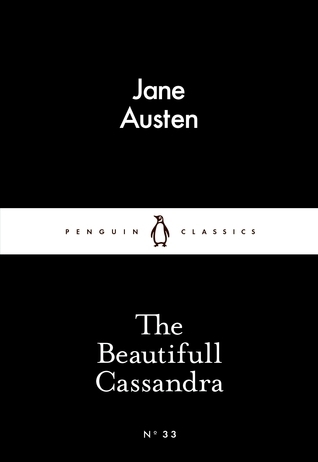 They are not the Austen we are used to; they don't involve important satirical social commentary, nor do they come across as affected by love as some of her later works. They are somewhat hilarious and provoking little clips of fun, that glaringly show Austen's talent was within her from an early age. Her spelling in places is incredibly askew, and Penguin's decision to leave these unedited portray a gorgeous picture of the naive author. I loved it. It's so easy to imagine a young Austen amusing herself by writing these, and giggling along to herself as she came up with more scandal and shock to surprise her family. She has her characters behave in ways which would be thoroughly condemned in her time, and this mischievousness is completely loveable.